Several uncomfortable truths of the initial rulers of independent India like Jawaharlal Nehru are whitewashed in the discourse on the history of this country. Those truths must be said as they are as and when we begin the much-needed course correction. At the stroke of midnight on August 15 when the nation erupted in joy to celebrate its 71st Independence Day, the bleakness of the day didn’t escape me. I couldn’t help but reminiscence the historical wrongs that have been systematically erased from our country’s collective memory by a party that has ruled India for the longest time. The horrors of partition continue to haunt me, and I abhor the concerted efforts to present history through rose-tinted glasses. Earlier this year when Buddhist spiritual leader, the Dalai Lama, speaking at an event in Goa said, it was Nehru’s self-centeredness that led to the partition of India, I admired him for his honesty and audacity. Though he later apologised for that statement in the face of political pressure, it was an idea that needed to be debated widely. More than seven decades after India won her independence, the political power-play between Mohammad Ali Jinnah and Jawaharlal Nehru that led to the brutal massacre of over one million innocents have been conveniently relegated to pages of history that are seldom opened. It deeply pains me to see the bloody legacy of our partition not even finding a passing mention in today’s time. It is important that we recall how the destiny of our great nation was shaped by leaders who in the guise of selfless service took decisions for their personal gains. Here, the role played by Nehru in the brutal dissection of a nation should no longer be spoken in hushed tones, but we as a nation should take responsibility for the past actions of those who led us and present a balanced version of history to our coming generations. Hailed as the architect of modern India, the time has come to ask a few hard-hitting questions about Nehru’s legacy. How can a person who deliberately created wedges in the syncretic culture of India be celebrated for his secularism? By the 1940s, it was clear that the two-nation theory was gaining traction and that for Jinnah such an idea was no longer a mere “bargaining chip”. He had invariably moved to the British side. Nehru despite being able to foresee the dangers of an India divided on communal lines, began to prepare the nation for what he then saw as an inevitable event. In 1946, when Muslim League Chief Minister of Bengal, HS Suhrawardy made inflammatory speeches in Calcutta that led to the first series of religious massacres in the country, no efforts were made to appease the masses. Such was Nehru’s love for power that the displacement of millions of people from their homes and the trains loaded with dead bodies which left bloody trails across the borders refused to move him. The idea of the ‘other’ and that of religious segregation got entrenched in the sub-continent and continue to divide societies even to this day. It will not be far-fetched to say that all of Nehru’s decisions were based on his heightened sense of ‘self’. After being sworn in as the first prime minister of independent India, Nehru was on a constant quest to appear righteous in front of the world community. It did not matter to him that his false sense of idealism would endanger a nation’s future. Perhaps it was because of this image that he so painstakingly built over a considerable period of years that the tragedy of partition which could be equated to Holocaust remains a case of warring communities and nothing more. When Operation Polo was launched to liberate the Hyderabad state, it was portrayed as a brave decision that the Nehru-led government took. Little is it seen and understood as the first massacre in Independent India. The findings of Sunderlal Committee Report that were finally released in 2013 have clearly indicted the reasons for the riots that followed which killed many people. Next is the case of Kashmir where he took into consideration the interests of just one community and compromised on the larger principle of national security. If the promises of a plebiscite were not enough to divide a nation, Nehru went a step ahead and gave special status to Kashmir. The Article 370 that was inserted into the Indian Constitution even to this day alienates the people from the idea of India as a nation. The clauses in the Article severely restricts the freedom of Indians from other parts owing property in the state which has prevented the blending of cultures to this date. Let us also not forget that Kashmir continues to be a burning issue with no solution in sight because Nehru at that time wanted to show his ‘magnanimity’ by taking it to the United Nations and allowing the international community to have a say on India’s internal matters. For a man who thought himself to be the greatest statesman of his time, it is a pity that he thought a nation’s sovereignty could be compromised for getting his name immortalised in the annals of history. It is this sense of despondence that led India to find itself in a humiliating position with respect to China. The incident remains among the very few instances in world history where a leader took a decision that was not based on geopolitical realities but on an unrealistic idealism. 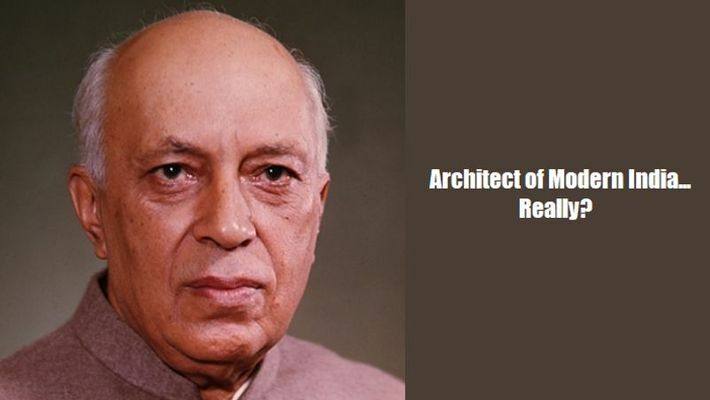 Even when General Cariappa informed him that the Indian military do not have the resources to battle the well-equipped Chinese army and the hostile terrain, Nehru went ahead with his decision of going to war and thereby jeopardising the security of an entire country. The lofty ideals of nationhood that he envisioned meant that important institutions of state power like the military never got the needed attention. Most of the ills of modern Indian politics can be attributed to Nehru. In refusing to push for a uniform civil code and giving far reaching rights to certain communities in the Constitution, he ensured that the seeds of dissent will continue to grow in the years to come. Added to this was the decision to reorganise states based on linguistic similarities. It was a direct attack on India’s diverse culture and traditions. It forced the people to see the nation as divided communities and homogeneity in outlook that shaped the nation till then was compromised forever. Let us also not forget that Nehru is the architect of dynasty politics. How the Gandhi family has destroyed the very fabric of the nation through varied power struggles and corrupt politics is only too well-known. So, the next time we sing our nation anthem with pride, let us all take a moment to realise that though the song is complete, what we are left with is a severed nation. The utterance of Punjaba-Sindhu-Gujarata-Maratha-Dravida-Utkala-Banga, brings with it the images of unimaginable miseries that people from both sides of the border have gone through as personal gains trumped national interests. Next Independence Day, let us also commemorate the bareness that Partition had brought upon all of us.